The12x12 Bbq Rotisserie Roaster utilizes your grill for the heat source and rotisserie motor and rod as the rotation device. 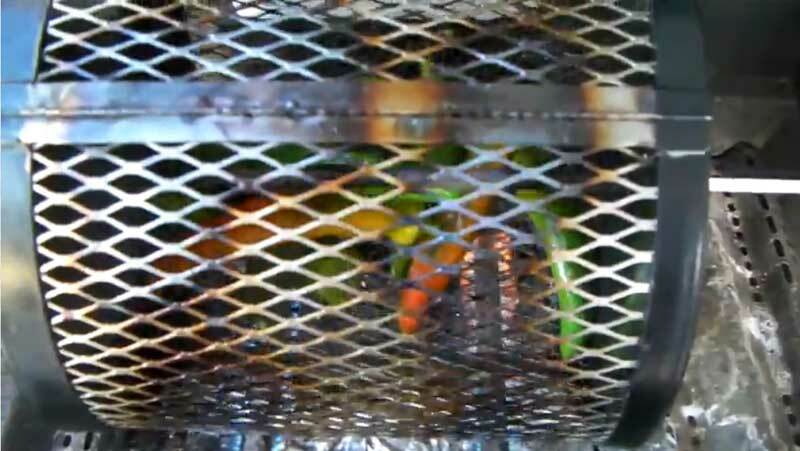 The rotisseries stock rod goes thru the baskets tube and is secured by 2 thumb screws. This roaster can hold 3-5 pounds at a time. The12x12 Bbq Rotisserie Roaster utilizes your grill for the heat source and rotisserie motor and rod as the rotation device. 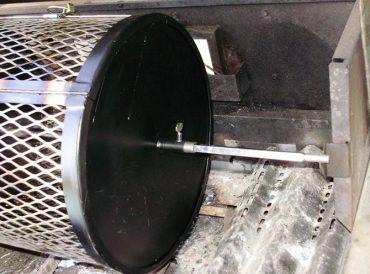 The rotisseries stock rod goes thru the baskets tube and is secured by 2 thumb screws. 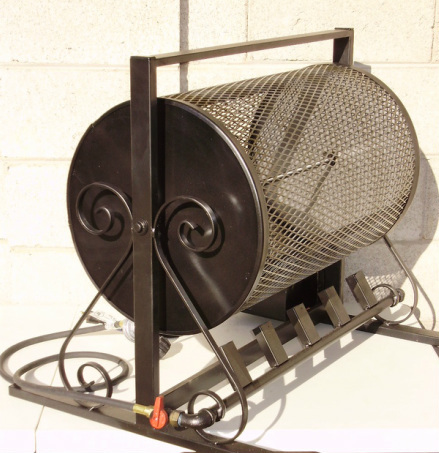 The 16″x24″ 5 burner manual hand crank roaster. This roaster comes with a regulator, gas valve and 5′ supply hose. Same quality construction as El Diablo Grande but no motor. This roaster can hold 15-20 pounds at a time. 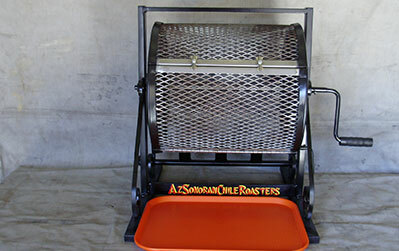 The 12×12 roaster is now available with a hand crank only. The motor has been eliminated. This will increase the capacity of the roaster and dependability. The complete roasters includes everything you need to get roasting. This unit has two high output burners, a pressure regulator, gas valve and a 5′ supply hose. This roaster can hold 3-5 pounds at a time. 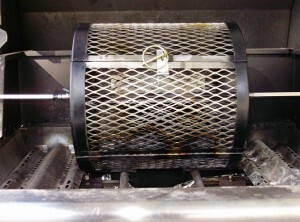 This 16×16 manual roaster is a new addition to our quality roasters. Features 3 high output burners,removable hand crank, pressure regulator, .5′ supply hose and a gas ball valve. This roaster can hold 8-10 pounds at a time. 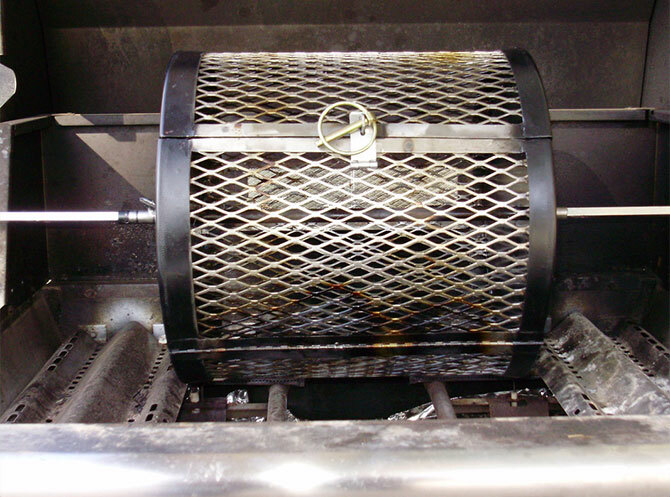 The 16″x24″ electric motor roaster comes complete with 5 high output burners, pressure regulator, gas valve and a 5″ supply hose. This model also includes a 120 volt gear motor with a pulley and v-belt system for proper torque and speed and an on and off weather resistant switch. This is one heavy duty motorized (no hand crank) roaster. This roaster can hold 15-20 pounds at a time. All AZ Sonoran Chile Roasters are all steel welded construction. They feature a full width door opening for easy access and removal of chiles veggies or whatever you’ve roasted. The basket glides on oiled bronze bearings flush mounted for a clean non-intrusive look. 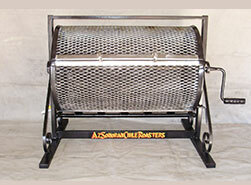 The AZ Sonoran Chile Roaster will give you a reliable solid roasting experience for years to come. © azsonoranchileroasters.com. An LLC company. All Rights Reserved..